Snow is in the forecast and I can't go skiing. This is the first time in I don't know how long that I won't be digging around for my rock skis the night before the first real snowfall kicks off the Adirondack ski season. Normally, I would be obsessively reading every online weather report available until I find one that says we can expect a measurable snow accumulation. Then the extrapolations would begin to determine how much snow will, or just might fall, on the Whiteface Mountain Veterans Memorial Highway. I am scouring the weather sites right now, but not with the hope of finding a forecast for accumulating snowfall. No, I am looking for 60 degrees and sunshine until November 15th when we move into our new home. Mother Nature has a funny way of not appeasing my every wish, so despite my whining, it looks like I will miss my usual first snow's ski on the Toll Road. In my book, working on our new home is worth missing one day of skiing, but I'll admit this isn't easy. Now my fellow skiers over at Harvey Road are making it even more difficult for me to not whine just a little bit. Those clever folks are having a contest to see who will ski the Toll Road and submit a trail report, and I can't play. It is raining right now, but snowing in the high country. The top of Mount Marcy is already swirling in white-out conditions. Since the forecast says the rain will switch to snow, heavy at times, this afternoon on Whiteface Mountain, I predict the Whiteface Mountain Toll Road will be skiable tomorrow morning. I'll miss it, but I'll be happy for everyone else who gets on their skis first thing tomorrow. And I'll try not to whine. 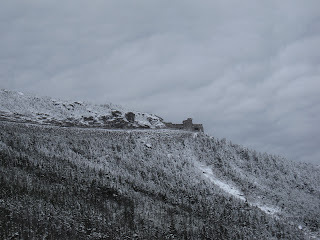 Whiteface Mountain Castle photograph courtesy of Joann Sandone Reed.